What is your go-to networking question? Share your answer/question in the comments below! What is a fortnight? It’s 14 days or 2 weeks. 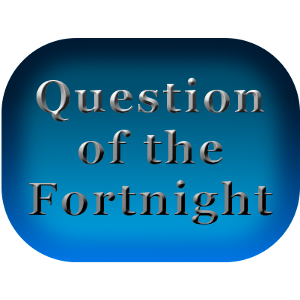 What is “Question of the Fortnight?” Every other week I’ll ask a question here on the blog. Through out the two weeks I’ll update the blog post with some of your answers. These will be from the comments below, from people I see networking and any other way I happen to receive your answer to the question. Next postWhat do driving directions have to do with your business? After we’ve chatted a bit and I know their business, my favorite networking question is, ” so what got you started in this direction/business”. I love to hear people’s stories about what launched their passion for their business. I’ve also found there are often many points in these stories to foster deeper connections with people. Makes networking fun for me! I always like to chat a bit, but one great question is “who is a good referral partner for your business?” Most people have some type of person that is a good referral partner for them, and asking that question means that I am trying to help build their business.